One of the aspects of mobile learning I enjoy the most is the “discomfort zone”. The painful realization that mobile is different from big screen devices, and the need to rethink the instructional design skills required to make the most of what mobile offers. The way you use your phone to support learning is NOT the same as the way you might have used an old-school e-learning course. e-Learning courses tend to be structured strongly around a specific episode of learning, whereas all the best mobile examples manage to weave learning more symbiotically into an employee’s working day. This leads to the discomfort zone. The recognition that taking my old skills (e-learning design) and applying them to a new technology (mobile) is only 20% effective. Learning designers work in an established industry with 10-15 years of design skills and tribal knowledge that has over-specialized in the big-screen use-case. The discomfort comes when applying it to another. The good news is – the mobile-guidelines are out there. We just need to look a bit wider than education, and learn from other disciplines. 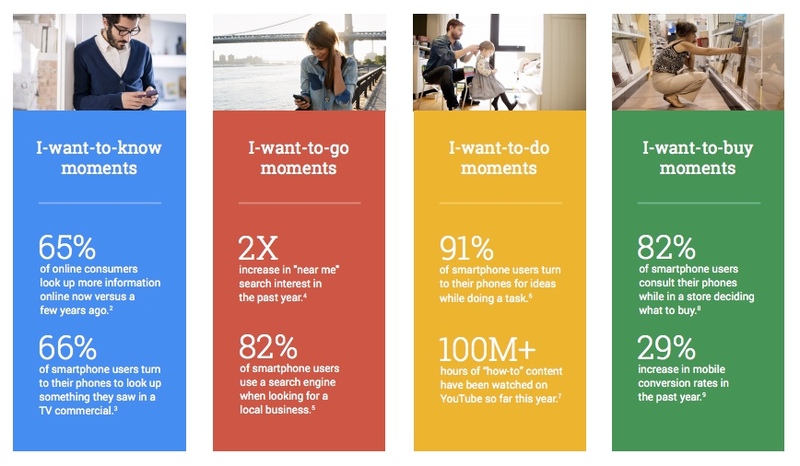 The latest source of good learning comes from Google Think, who recently published the 4 new moments every marketer should know. I want to do: Google claim “91% turn to their phone during a task”. I can easily believe this. But if your content is locked into a 45 minute course you can be pretty certain they won’t be going there at their moment of need. Make your content more relevant, and easier to find than a YouTube clip! So the lesson here is to keep your eyes open for new opportunities to learn about the world of mobile, and DEFINITELY, to make sure any mobile learning you design takes into consideration that different stages of your learner’s journey, and different contexts they might be in when accessing your content. One of the biggest challenges facing early mobile learning adopters is how to migrate non-mobile content to mobile. In this article, Mayra Aixa Villar introduces a “device independent” model for thinking about content migration that can be used as the basis for future content strategies in mobile learning projects.